When you’re on the go, cigar travel cases will perform the same job, keeping your wraps shaded yet blocked from exposure. Reviewed below are five of the highest quality cigar travel humidors for you to take anywhere, each of them having their own perks and style. Be sure to view the Buyer’s Guide as well so you’ll know which pick benefit you the most. Can a Cigar Travel Case Replace my Home Humidor? The Amancy Travel Leather Cigar Case looks something like a coffee cup holder at first glance, having a cylinder shape throughout the entire body of the case. Polyurethane (PU) leather holds the canister in place, large enough to accommodate about five cigars. It’s great for ring-sized cigars that aren’t too long, so if you fancy anything that’s about the size of a Churchill, you should have no issues getting them to fit at capacity. The small shape might not fit in your pocket but should easily go in most luggage. If you’re just traveling with the case to work or in a cigar shop close by, hand carrying should suffice. Being that its leather, you’ll have to make sure that nothing drops in those instances. The inside is also layered with cedar wood, which helps hold in moisture must better. There’s a hygrometer and humidifier tube sold with the case. The former is not entirely accurate, so if you’re big on getting the temperatures just right, you might want to purchase a digital piece with it. But truthfully, that would defeat the purpose of acquiring this in the first place! Anyhow, the Amancy case is sturdy to hold up during long trips on the road. You’ll have to check on the humidity quite often, depending on the area you live in. And while it’s not perfect, there’s enough here to give it a high recommendation for any cigar aficionado. 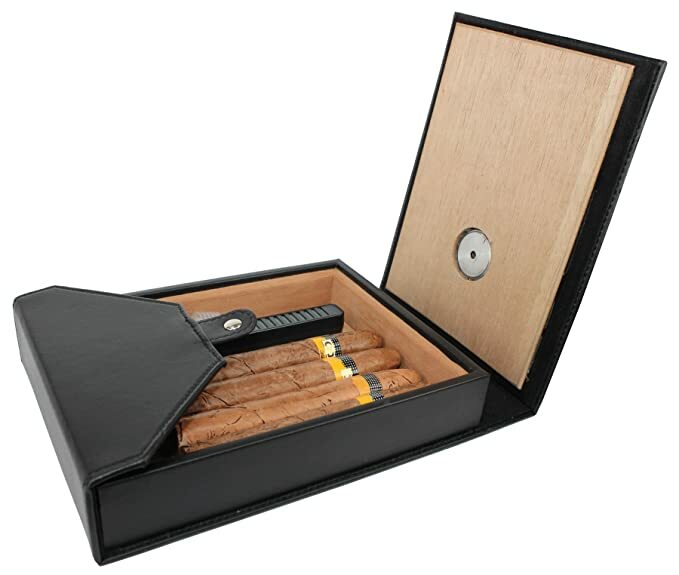 The Cigar Caddy 3400 Humidor is the best on the list in terms of durability. It looks like a smaller version of something you’d see in a military setting. And this is in no way a bad thing. If you threw it off a roof, chances are high that the product would have little damage to speak of. But why is this? First, there’s the hard plastic exterior. Very dense and thick, your cigars will be completely covered shielded from drops and falls of any kind. There’s also a plastic rim around the edges that gives it a watertight seal. You could probably submerge it in water and have your cigars come back completely dry. While the ability to withstand forceful impacts is always a plus, there are a few weaknesses to the design that you should know about. The greatest is the locking clips. They work as expected but may periodically pop open at times. And if you’re not careful with the way you pull them open, could end up breaking altogether. Furthermore, there’s a sponge included that smells strongly of polyurethane. To get it out, you’ll have to remove and clean the case’s interior (discussed in the Buyer’s Guide). 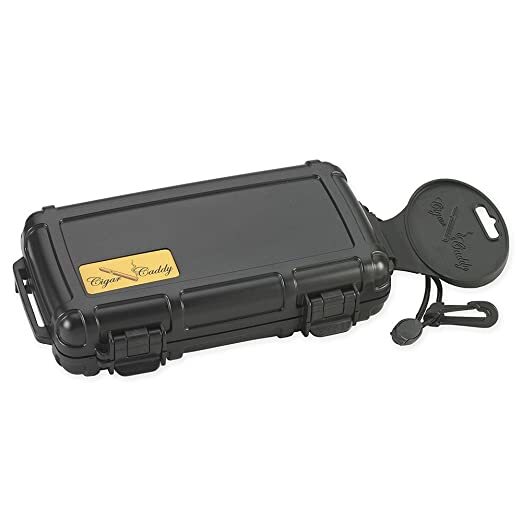 But even with its minor problems, the Cigar Caddy 3400 is strongly suggested for if you enjoy the outdoors and don’t want to end up with wet and/or dirty sticks. The case is designed to withstand hard impacts and drops. You probably already know about Cohiba’s distinguished cigar brand. They have consistently churned out some of the finest cigars in the world. But there’s also humidors, both for travel and the home, in their line of products. 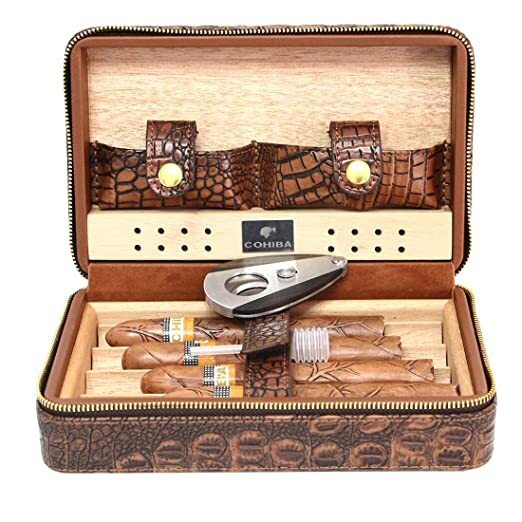 The Portable Cigar Humidor Case is stitched with crocodile-patterned leather grain and a surprisingly thick cedar wood tray, of which can hold about four Churchills. It has two pockets at the base of the lid, the portion that lifts up as you open the case. This is for the cutter (included with the product) and dropper. If you need a humidifier and hygrometer, you’ll have to buy it separately but they both should fit in the case so long as you ensure they’re small enough. Just place the hygrometer in the second slot that’s next to the pocket for the blade. And if you simply need more room to store your cigar for a short time period, the cedar wood box easily lifts out. When this is done, you could easily double the number of sticks that could fit inside. Or pack anything else that you’d like; the zippers are strong and will hold up, even under a lot of weight. Because it has more of a traditional design, this Cohiba humidor works best for people that need a place to store their cigars for a little bit longer than the other products reviewed, but don’t plan on keeping them inside for too long. There are additional pockets fitted on the back of the lid to hold tools, lighters, etc. 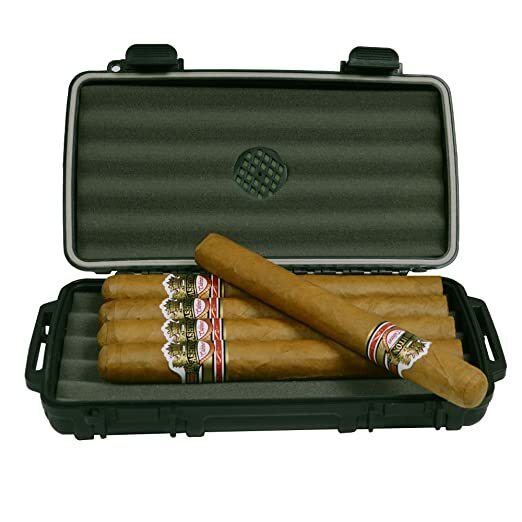 Another Amancy product, the 5-10 Capacity Travel Case is most beneficial to carrying larger amounts of cigars. With this in mind, it’s the ideal product to take with you to cigar shops, where you can quickly place what you want inside after new rolls are purchased. Although limited, you might even be able to throw in a few larger varieties such as a Toro. It has a basic design made from PU leather. 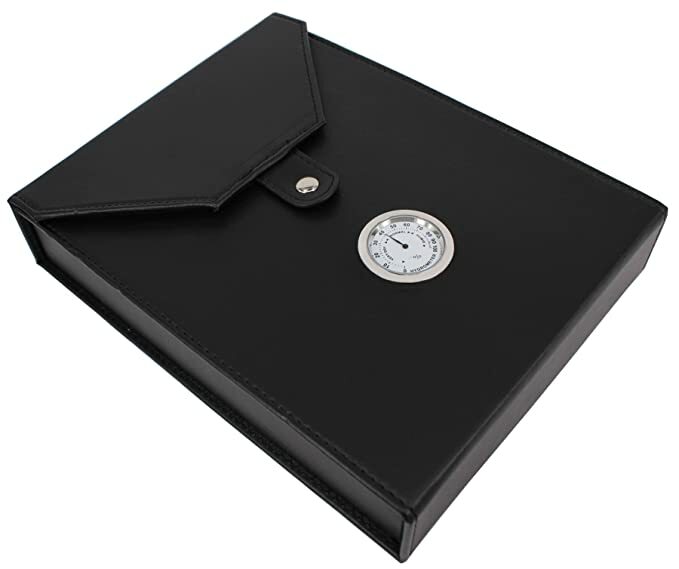 The lid is flipped open by unfastening the buckle located above the hygrometer. This product is handmade. Because of this, you might find a few imperfections around the outside close to where the hydrometer touches the leather itself. It’s nothing major, but it may force you to adjust the meter so that it’s parallel with the case. And there won’t be a need for you to get a humidifier. Everything is included with the case, save for a cutter. If you’re new to cigars and storing them, the manual won’t help you to get the inside temperature just right for your smokes. The safest bet is to keep things slightly dry until you become familiar with the mechanics. That way, you won’t have to deal with mold developing. As with many small humidors, the hygrometer isn’t very useful at pinpointing humidity levels. You’ll get an indication of how high or low it is but might find yourself gauging the cigars on your own, opening the top to feel if there’s more or less water needed. And if you are carrying around lots of sticks, definitely do it so nothing becomes damaged. Regardless, this Amancy case is as acceptable as the other piece analyzed, and will keep you stocked with more than enough cigars when you’re out and about. 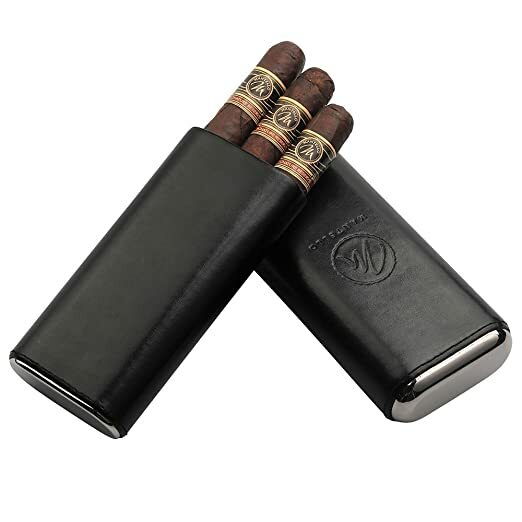 The Mantello Black Leather Cigar Case finalizes with its compact shape that’s small enough to go in most large pockets. Even with its three-cigar capacity, the level of work placed into the build will make it your go-to cigar carrier, one that might be used more frequently than any other the cases observed. One nice feature is the way it adjusts to the size of the cigars being carried. You’re free to make the top and bottom pieces smaller or larger in height. This also opens the door to good accessories. When adjusted higher, you can place a small humidifier inside, or alternate with a small hygrometer even (just remember that it will have to go in, so there won’t be a way for you to read the humidity level from the outside). Get ready to do some preparation work before you use it, however. The smell of polyurethane is pretty strong, something you don’t want to tarnish your cigars. Once that’s done, everything should work as normal. Lastly, don’t push down on the lid when you have cigars inside that are long enough for the piece to move in. If that happens, things could get smashed and break apart from the force. It would have been nice if there were something that could stop the sliding on its own. Still, you’ll come to appreciate the painless way Mantello simplifies your cigar storage. If you have lots of cigars and don’t know what to do with them, you should consider storing them so they won’t become stale. Almost all types of tobacco products will eventually go bad, but this especially applies to cigars. They must be set at the right temperature, depending on location, to drying and molding. Cigar Humidors are great for this but aren’t mobile. Next up is some valuable tips to help you select the best case for your cigars, including useful ways to properly case for the product before you begin using it. How often do I Smoke? Heavy smokers tend to need more space for their tobacco. A cigar aficionado will regularly try out many different types of flavors and tend to switch up from time to time. So after one cigar is finished during a smoke, other flavors might be desired that are different from the original. Due to this, multiple cigars may need to be carried, according to what the user (or you) wants. You might not be a heavy smoker, but have something planned that would require you to need ample room to store your cigars, either for yourself or friends. And if you are, that’s a good excuse for placing quantity over any other feature. Most cigar travel cases are very small, small enough to fit in your pants pocket. Knowing this, consider getting a piece that’s big enough to hold at least four or five cigars total. Cigar sizes are also varied, so you may possess something that’s longer than usual. Or maybe you gravitate more towards cigarillos. Whatever the case, gauge the sizes on the cigars most favored by you and choose a case that best matches it. How do I Clean My Case? Cleaning is pretty straightforward but does have a few steps. The reason you’ll want to clean your case before it’s used centers around the materials placed on the product when it’s manufactured. Polyurethane leather is the one most commonly featured. Most cases also incorporate cedar wood into the interior but that does little to take away the leathery smell. The odor is something that can severely affect the quality of your smokes, so take these steps before you place anything inside. There are two ways in which a small humidor can be cleaned. The first is by simply airing the interior portion out for a few days. You can do this by placing the case in an area that’s dry. Open the lid and leave it that way until you don’t smell anything inside anymore. If there are foam pieces included with the case, take them out and allow it to soak in distilled water between 30 minutes to an hour. After that, continue to let it dry. You’ll notice that everything comes out odorless once there’s no moisture left. It is here that you’re free to use the case. The second way is similar but involves soaking the interior with distilled water first. It’s best to go no longer than 30 minutes for this so as to avoid damaging the cedar wood. The odor should be depleted after it dries out, preferably for a day or two. If you still notice chemical smells coming from the case after its been cleaned, try giving it a little more time to air out, or place it in a cabinet or somewhere where the air is even drier. Of course, not all cases will need to be cleaned in this matter. An alternative to the methods described would be to simply add a few pieces of tobacco from the cut tips of a cigar, thus allowing those to overpower the chemical smell within a few days’ time. Where do I Plan To Use the Case The Most? Humidors, whether indoor or mobile, must be set up in a way that coincides with the environment around it. If you live in a location that receives lots of cold, dry weather during the winter months, you’ll probably need something that’s large enough to hold a humidifier. Less humidity will be needed in hot climates, so if you’re planning a vacation somewhere close to water or reside in a state that remains moist for most of the year, less water will be necessary. 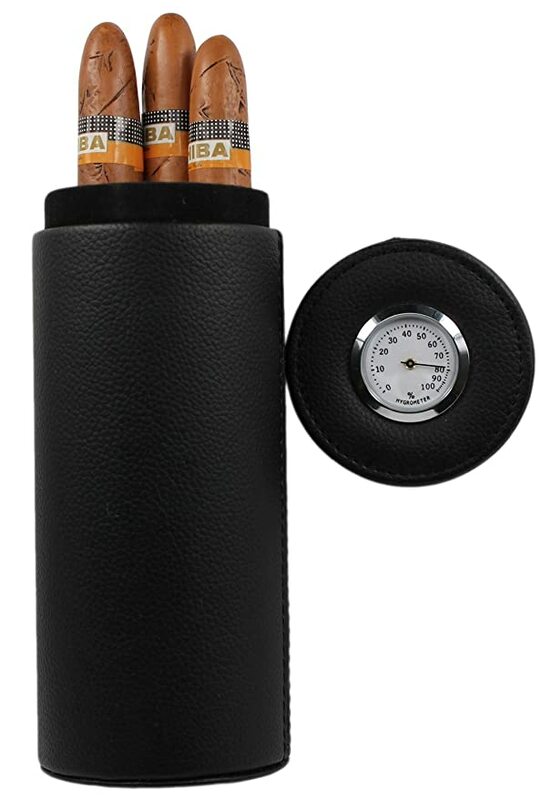 Too much heat and humidity can quickly turn your cigars into moldy pieces of tobacco leaf.Furthermore, those who experience all four seasons will love the cases with the hygrometer and humidifier sold with the product. The more tools you have for your cigar storage, the least likely you’ll risk having to throw spoiled tobacco in the trash. If you’ve flown on a commercial airline in recent years, you should be familiar with the strict rules that security places upon carry on and check-in luggage, and the items inside or those being carried in your pockets. TSA doesn’t restrict tobacco products on either domestic or international flights (outbound), so you’re free to bring a cigar travel case while in the air. Just be careful with humidifier tubes, if the case you are interested in has one, take note that some items containing liquids could be confiscated. This is oftentimes at the discretion of the agents but if you’re a frequent flyer, you might be better off with a case that doesn’t have such accessories. It depends on how many cigars you keep and your frequency of smoking. 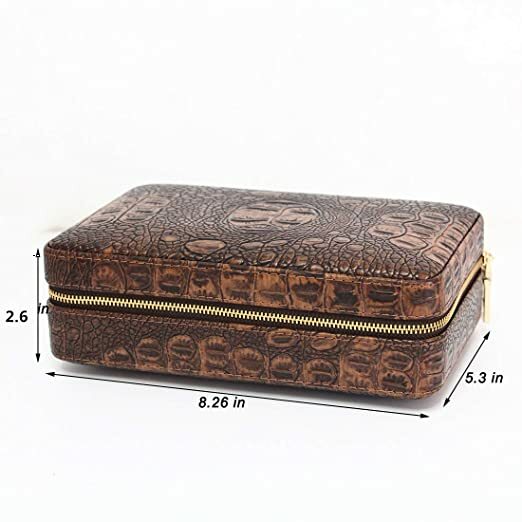 Technically, the travel cases can be used in an indoor setting but are more sensitive to temperature and humidity changes in the home or room than a larger humidor. The products reviewed should be thought of as an extension of a larger device. In this sense, treat your smokes in the same manner that you would do to perishable items during grocery shopping. When you acquire new cigars, take your case with you to ensure freshness until they’re transferred to something larger and more permanent. Every cigar case on the list has benefits. They are all well made, some even being handcrafted. Each will definitely store your rolls much better than the small plastic bags they’re sold in. And all can be used at travel-friendly accessories which are easy to carry and place into larger sets of luggage.